- The built-in microphone provides you hands-free calling, switch to hands free model automatically from music playing status when receiving call. - It features dual USB outputs 5V/2.4A&1A, that lets you steam music and calls directly from your bluetooth device to your car fm stereo system and charge your phone simultaneously. - Multi-function Button Control: Play/Pause, Previous/Next song, Volume up/down; Answer/Reject calls, Redial call. - Plug and Play: Plug the FM transmitter into vehicle's lighter or power port. The LED will detect and displays the car battery voltage for 5 seconds, next the device enters into Bluetooth pairing mode, LED will displays BT & FM Frequency. Turn your radio to an unused FM frequency, then match this device to the same frequency, then there you go! 1.First time to using bluetooth, you need to pair your mobile phone with this unit. Activate your phone's bluetooth function, then search new device. When the mobile phone detects this unit(named as "C26S"), please press this name to connect. 2.Insert a USB flash driver which containing MP3 files into the right USB port. It will play and transmit the MP3 files automatically. (only the right USB Port can sever as a USB Reader). ☑️ Hands-free Calling & High-quality Sound: Built-in quality microphone with Noise Suppression CVC Technology to create full duplex crystal sound quality. Just click a button to answer / redial / end a call. Seamlessly connects and switches between incoming calls and music. ☑️ Two Music Playing Mode: Bluetooth & USB Connections, a perfect solution for those of who don't have an auxiliary jack in their car and don't have Bluetooth capabilities. You can also insert a USB Flash Drive that contains MP3 files into the Right USB port and enjoy it. 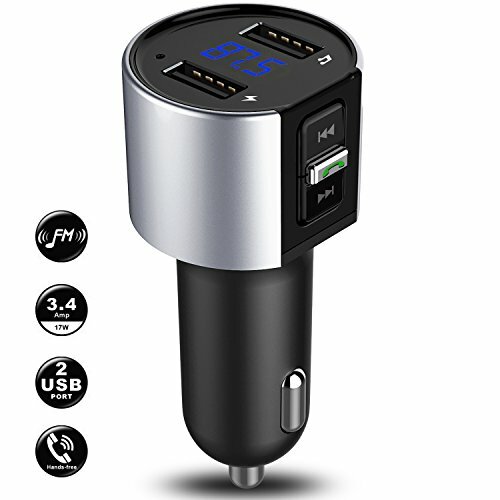 ☑️ Dual USB Car Charger: Comes with 5V-2.4A and 5V-1A charging ports which output 3.4A total, support charging two devices simultaneously. Intelligent shunt to ensure that the current is stable and safely charging to your device without damage to the battery. ☑️ Voltage Detection & FM Display: The Car Voltage and FM Frequency will be displayed on the LED digital screen. Real-time monitoring of automotive voltage makes driving more secure and convenient, provides you portable driving travel. ☑️ PLUG and GO: Just plug it into the cigarette lighter socket, turn your car FM radio on, tune the car radio to the same frequency (range from 87.5 to 108 MHz); Pair it with your phone via Bluetooth, then there you go! Compatible with all bluetooth enabled devices, such as smartphone and tablet. We provide worry-free 1 year warranty and ongoing customer service. Welcome to contact us via Email at: support@esolom.com.